Based on reviews from 41 experts and 4,173 users. 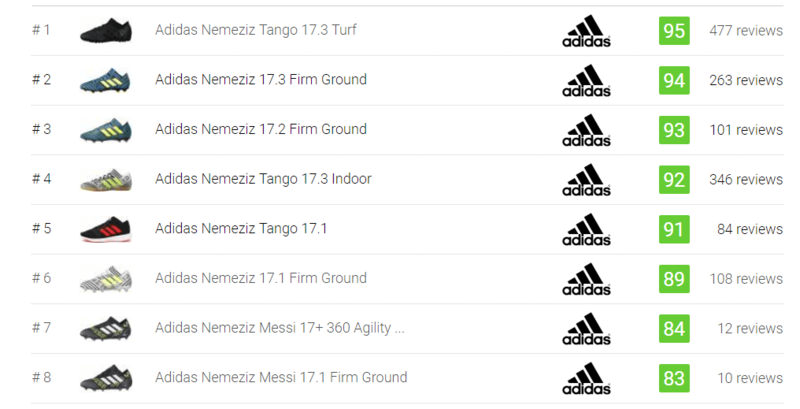 Learn how our rankings work or see our guide to Adidas Nemeziz football boots. Updated Apr 2019. Have you ever seen a football boot as unique and wild as an Adidas Nemeziz football boot? Built alongside the other key silos, Adidas Ace and Adidas X, the German sportswear giant intended for this series to stand out from the rest of the football boots on the market. Let us have a quick look at what makes the Adidas Nemeziz football boots a class of its own. The Adidas Nemeziz football boots are designed to provide the most skin-tight fit. It is for sharp and light-footed players who strike from anywhere at any time they wish. Famous athletes like Lionel Messi, Julian Draxler, and Roberto Firmino were seen wearing this phenomenal football boot. With the success of the first laceless football boot from the Adidas Ace series, the company has set out to create yet another revolutionary laceless boot that will allow the foot to bend and flex freely as the player makes quick cuts and changes of direction. Adidas has worked with over 200 football athletes in order to make the Nemeziz a reality. The striking design of the Adidas Nemeziz football boot took inspiration from the common ritual of wrapping and taping the foot with elastic tape. This practice was believed to enhance reflexes and provide stability. Adidas used a variety of innovative materials in the upper to achieve this goal. Since the Adidas Nemeziz football boots are known to be tech-heavy, here are the notable technologies found in this series. 360 Agility Bandage. This revolutionary technology is made up of bandages that are stitched together to form a one-piece upper construction. Because of its elastic nature, Adidas Nemeziz football boots with the 360 Agility Bandage provide excellent fit without any pressure points. It enhances the player’s natural touch on the ball, especially in tight spots. The Agility Bandage material is found in the upper of both the Adidas Nemeziz 17+ 360 Agility and the Adidas Nemeziz 17.1. A strip of Agility Bandage is also found in the collar area of the Adidas Nemeziz 17.2. Torsion Tape. This non-elastic material wraps all the way around the Adidas Nemeziz football boot. It is responsible for keeping your foot locked in place. This technology is found in the Adidas Nemeziz 17+ 360 Agility FG. Dual Lock Collar. This is another amazing technology that gives the Adidas Nemeziz football boots their distinct V-shaped collar. It is made up of two Agility Bandages that secure the ankle in place. It provides additional stability and lockdown, especially when making explosive movements and changes of direction. AgilityKnit 2.0. This technology is an updated version of the one found in the Adidas Messi 16+ Pureagility and Adidas Messi 16.1. Found in the forefoot area of high-end Adidas Nemeziz football boots, this interlocking yarn structure offers the right amount of grip on the ball. It is covered with a thin layer of synthetic material for enhanced durability and texture on the surface. AgilityMesh. It is a thin mesh-based material that makes up the forefoot area of takedown Adidas Nemeziz football boots. It provides a close touch and feel of the ball. TorsionFrame. This new soleplate from Adidas features a dual layer spine in the middle. The stud configuration for firm grounds (FG) is composed of seven half-moon-shaped studs in the forefoot and four in the heel. Torsion System. It is a lightweight support system which helps to prevent incorrect flexing of the arch. It allows the forefoot and heel areas to move independently from each other. Climacool. This unique technology uses a 360 ventilation system for increased in-shoe breathability. It keeps the foot drier and cooler even while wearing the shoe for long periods of time. The Adidas Nemeziz 17+ 360 Agility and the Adidas Nemeziz 17.1 are the top-tier models of the Adidas Nemeziz series. They are almost identical when it comes to tech specifications and upper construction. The biggest and most noticeable difference between the two football boots is in the area where you can find a lacing system on the Adidas Nemeziz 17.1. Whether you are using a laced or a laceless football boot does not mean it’s the better option. Adidas just gave us two great options for doing things. If you’re having a hard time deciding which one to buy, below is a short comparison of what you can find in both football shoes. The difference in the lacing system. The Adidas Nemeziz 17+ 360 Agility is the second laceless football boot from Adidas after the Adidas 16+ Purecontrol. The elastic bandage upper wraps the foot snugly. Because the material is very stretchy, the TorsionTape helps in providing adequate lockdown and responsiveness to the football boot. Adidas Nemeziz 17.1 football boot, on the other hand, uses its lacing system to lock the foot in place. In addition to its one-piece construction, the laces reinforce and stabilize the central portion of this football boot. The difference in price. The laceless Adidas Nemeziz 17+ 360 Agility is more expensive than the laced up Nemeziz 17.1 which costs $95 lesser. The premium rate of the laceless football boot comes from the quantity of TorsionTape which covers almost the entire upper. With the Nemeziz 17.1, a thin elasticated material covers the midfoot area, instead of the upscale wrapping technology. When choosing the right football boot, it is essential to know which surface you will be playing on, whether firm ground, soft ground, artificial turf, or concrete. Football boots are made with different soleplates depending on the abovementioned playing surfaces. 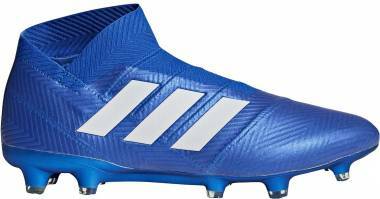 Firm ground football boots - The soleplate of top-tier Adidas Nemeziz football boots is made of a stiff material which adds to the responsiveness of the shoe. It also has stiffening bars in the middle. The studs are semi-conical-shaped with the bladed side facing the inside and the curved side facing the outside. Thus, this new stud configuration has the impressive maneuverability of conical studs and the acceleration power from the bladed studs combined. 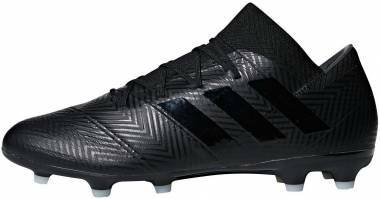 The Adidas Nemeziz 17.3 Firm Ground, Adidas Nemeziz 17.2 Firm Ground and Adidas Nemeziz Messi 17.2 Firm Ground are the mid-tier and low-tier models of the Nemeziz firm ground football boots. 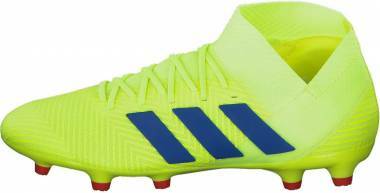 Soft ground football boots - This type of Adidas Nemeziz football boot is best used on muddy grass surfaces. It features the same upper and soleplate as the FG versions. The difference is in the stud configuration. You will find six removable metal studs in varying lengths. The Adidas Nemeziz 17.1 SG is one of the soft ground football boots in the lineup that features aluminum studs. Indoor football boots - The cool-looking Adidas Nemeziz 17+ 360 Agility Indoor is one of the most expensive football shoes for the indoor variation. The upper is also made up of Agility Bandages sans the TorsionTapes. You will also find a layer of polyurethane with Non Stop Grip dots in the high-wear zones such as the forefoot and toe box areas. It protects the football boot from rubbing directly against concrete or asphalt surfaces. This Adidas Nemeziz football boot features a foam midsole through the heel area. Its low-profile outsole is made up of two kinds of materials - durable leather in the forefoot and heel and straight-up foam in the middle. The Adidas Nemeziz Tango 17.4 Indoor and Adidas Nemeziz Tango 17.3 Indoor are some of the notable indoor shoes in the collection. Turf football boots - The outsole of a turf Adidas Nemeziz football boot is made of solid rubber. The stud configuration is composed of a number of nubs spread throughout the bottom. One of the best turf football boots from this series is the Adidas Nemeziz Tango 17.3 Turf. Street football boots - An interesting Adidas Nemeziz football boot comes in the street variation. The upper of the Adidas Nemeziz Tango 17+ 360 Agility is made with the same Agility Bandage technology found in the Adidas Nemeziz 17+ 360 Agility. The outsole uses the Boost technology found in other Adidas running shoes. Also, it features the Continental outsole for excellent grip in both dry and wet surfaces. The Nemeziz Tango 17.1 is one of the street shoes in the lineup. It features semi-transparent outsole that exudes a radical street look. Do I need a shoe horn in order to put on the Adidas Nemeziz 17+ 360 Agility? Generally, you do not need pull tabs nor shoe horns. The football boot is engineered to easily push your foot in through the stretchable TorsionTape. It will also help if you angle your foot and use the front and back lip as the pivot points. If you are wide-footed, you can always opt to use a shoe horn so you can slip the shoe on much easier. Which football boot silo is the Adidas Nemeziz comparable to? The Adidas Nemeziz football boots are most often compared with the Nike Mercurial and Nike Hypervenom football boots. Is the Adidas Nemeziz football boot exclusively for men only? No, there are also Adidas Nemeziz football boots for women. There are some slight differences in the upper construction and fit between and men’s and women’s versions. Likewise, this football boot series is also available in kids unisex version. How do I clean my Adidas Nemeziz football boot? Cleaning an Adidas Nemeziz football boot can be tricky especially if you have the Dust Storm colorway. Doing so will not only make them look good every time you wear them on the pitch, it also extends the lifespan of your shoe. Always use lukewarm water when cleaning your Adidas Nemeziz football boot. Gently clean the upper of your football boot using a soft brush. Wipe off the dirt from the sole plate using a soft cloth. If there are hard chunks that are stuck in between the studs, you may use a brush to remove them. Use a soft-bristled toothbrush to remove the dirt from hard-to-reach areas, such as the corners and highly detailed zones. Remove water from the boot using a soft cloth. Stuff your Adidas Nemeziz football boot with newspaper to absorb excess moisture from the inside. Allow your football boot to air dry. Never place them near any sources of direct heat like a radiator or heating closet. How can you tell if an Adidas Nemeziz football boot is fake? The Three Stripes branding on a real Adidas Nemeziz football shoe is embossed to the boot itself. On the fake ones, the Three Stripes logo is stuck to the football boot. 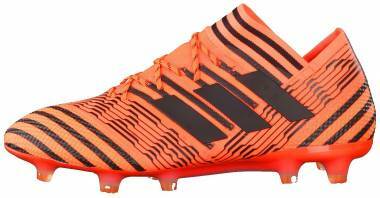 The color of a real Adidas Nemeziz football boot is light orange. The fake one has a slightly darker orange color. A real Adidas Nemeziz football boot has a black heel tab, while the fake pair has an orange heel tab.